Alabama town "looks like a war zone"
President Barack Obama: "I've never seen devastation like this"
Read more about this story from CNN affiliates WBMA-TV and WIAT-TV. Tuscaloosa, Alabama (CNN) -- Hopes of finding trapped survivors dwindled Friday evening in Alabama, the epicenter of storms that obliterated neighborhoods and towns and claimed scores of lives across the South. Gov. Robert Bentley, speaking in Birmingham, said the long road to recovery will now begin. "We've gotten past the rescue stage," Bentley said. "We have begun the recovery stage." Earlier Friday, President Barack Obama toured rubble-strewn neighborhoods in Tuscaloosa, declaring the devastation brought by a series of powerful storms and tornadoes was beyond anything he had ever seen. The storms killed at least 326 people in six states and left entire neighborhoods in ruins. Obama promised expedited federal aid to states affected by the tornadoes. Has the severe weather affected you? Share stories, photos and video with iReport. "We're going to do everything we can to help these communities rebuild," he said. Wednesday's outbreak of severe weather brought what the National Weather Service categorized as a rare EF-5 tornado to one Mississippi town. And according to the weather service, it's possible another twister was on the ground for 200 miles from Mississippi through Alabama. The extent of the devastation became evident by Friday, when the death count in Marion County in northwest Alabama rose from three to 21, according to the state Emergency Management Agency. It said 20 people were missing. Marion County Sheriff Kevin Williams put the number even higher -- 29 people dead in the city of Hackleburg and six in Hamilton. The Hackleburg fatalities included 16 on the scene and 13 who died at several hospitals, he told CNN. "It's pretty much wiped out," Williams said of the town. "It looks like a war zone." The possible tornadoes destroyed a Wrangler clothing plant, a pharmacy, doctor's office and three schools, officials said. Alabama suffered the greatest of loss of life, with fatalities in 19 counties confirmed by the state Emergency Management Agency. The agency reported Friday evening that the state's death toll had risen to at least 238. In Tuscaloosa, Obama's motorcade passed street after street of homes reduced to splinters, crushed and flipped cars, and widespread debris on the way to his first stop to visit with families affected by the storms that pounded the region Wednesday and Thursday. "I've gotta say I've never seen devastation like this," Obama told reporters. Tuscaloosa city officials reported 45 deaths as of Friday afternoon, but later revised that to 39 because of a counting error. That change was not immediately reflected in the state's total. Nearly 450 people were unaccounted for Friday afternoon in the city, although they were not necessarily missing. The president's visit took place as emergency responders in Alabama and five other states continued to assess the damage wreaked by one of the worst outbreaks of violent weather in the southeastern United States in decades, experts said. The storms leveled neighborhoods, rendered major roads impassable and left nearly 800,000 customers still without power Friday evening. CNN iReporter Stephen Bozek, a broadcast news major at the University of Alabama in Tuscaloosa, snapped a photo of a U.S. flag affixed to an overturned vehicle. "The neighborhood is torn to pieces and the flag flying represented the unity (of) this town," Bozek wrote. In Mississippi, where 34 were confirmed dead, Gov. Haley Barbour told reporters that some people remain unaccounted for and rescuers could still find bodies in the rubble or in the waters surrounding Smithville, where 14 of the state's known death's occurred. He said the city was a scene of "utter obliteration." On Friday, the National Weather Service said the tornado that struck Smithville on Wednesday was an EF-5 storm with peak winds of 205 mph. 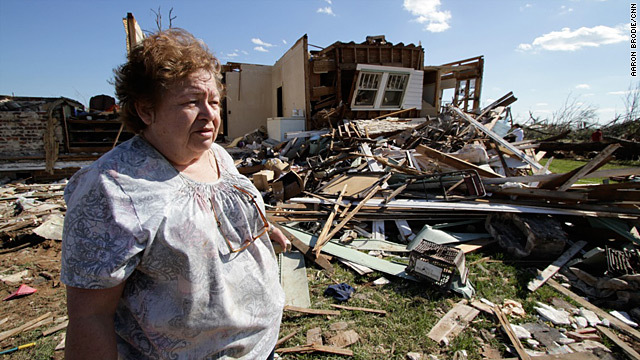 The last such tornado recorded in the United States struck May 25, 2008, in Parkersburg, Iowa. The tornado, the Weather Service said, destroyed 18 homes, a post office, a police station and a water treatment system. In addition to the 14 deaths, it caused 40 injuries, the weather service said. Obama issued a federal disaster declaration for seven Mississippi counties. The storms also left 34 people dead in Tennessee, 15 in Georgia, five in Virginia and one in Arkansas. In Alabama, emergency management officials said Friday that 35 teams have been deployed to Tuscaloosa and six other counties hit hardest by the storms to assist in recovery efforts. Officials also warned Tennessee motorists not to cross the Alabama state line without filling up their tanks first. Widespread power outages and devastation from the storms have likely rendered functioning gas stations in northern Alabama hard to find, according to a statement released by officials in both states. The storms cut swaths of death and destruction along U.S. Highway 72 in northern Alabama and Interstate 59 from Tuscaloosa County to the northeastern corner of the state. Tuscaloosa Mayor Walter Maddox said at least one strong tornado swept through the city, leaving dozens of roads impassable and destroying hundreds of homes and businesses. "It literally obliterated blocks and blocks of the city," Maddox said. The city remained under a curfew for Friday night that was scheduled to expire at 6 a.m. Saturday. City officials early Friday also advised Tuscaloosa residents who live south of the Black Warrior River and east of McFarland Boulevard to boil their tap water. Obama had signed a disaster declaration for Alabama, which enables storm victims and damaged businesses in eight counties to seek federal aid. Such aid will be critical, Birmingham Mayor William Bell told CNN affiliate WBMA. "It's beyond our local resources so we're going to have to get the federal government involved," Bell said. "The president assured us that he would do that." The storms are being compared to the "super outbreak" of tornadoes on April 3 and 4, 1974, Craig Fugate, the FEMA administrator, said Thursday. 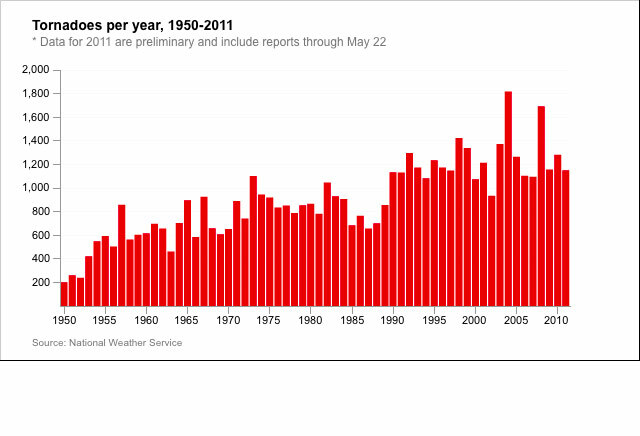 In that period, 148 tornadoes were reported in 13 states, and 330 people died. States affected were Alabama, Georgia, Illinois, Indiana, Kentucky, Michigan, Mississippi, North Carolina, Ohio, South Carolina, Tennessee, Virginia and West Virginia.